Cowboy came through easily describing himself to Anna as a black and white paint, conformation of hind legs and shoulder a little upright, good body condition, not too fat. He showed his eye as bright, soft and engaging. He at first showed her his surroundings at SMTRC. She described the red barn, white farm house, the mini’s paddock and run-ins. He showed our fields as mostly grass, wet at times, not sand. He showed that he does well on the hay and the hay comes “reliably” as needed. He showed himself with children, he even showed two little girls sitting on his back dressed in pink. Anna explained that the girls may not be something that he has done but could be his way of showing his desires or abilities. He showed being ridden in our dually halters and at times a snaffle bridle, both of which he is fine with. He described his work as not too strenuous. He shared he has had shoes on before but does not have shoes on now. He did show her that he is wearing a glue on wrap with no nails on his feet and we have discussed possibly using glue on shoes. All of these facts I was able to confirm. He described his insulin resistance laminitis as having reoccurring episodes two times per year with some effects of the disease staying in his body all the time. He believes that the grass triggers episodes more than hay does. He showed himself as at times having sore feet and wanting to walk on soft footing. He describes the care he has received here at SMTRC as extraordinary. He especially loved having his feet soaked, sometimes in Epsom salts. We asked him if he was suffering and he feels that he manages the discomfort well and knows that it will pass shortly. He at no time seemed discouraged by his condition. He very much wants to continue his rehab. If he has to leave the farm to do this he understands. He is not looking to being retired and sees himself as being sound enough to work with children. We will honor his vision of “seeing himself as going to get better”. He showed pictures of a different farm with dirt paddocks, tall pine trees, animals, and minis. Definitely not SMTRC. He showed it as a place that he could go. A close friend of mine, Sarah Mirhead, has a farm that fits this description and is set up to do rehabilitation, she has offered to give Cowboy a home and continue his rehabilitation. He will be living with minis and goats and plenty of hay and turn out. Sarah is a trimmer, and has a homeopathic practice. She works with Dr Regan Golob on a regular basis. Dr. Golob has worked on Cowboy several times at SMTRC. She will continue to treat his laminitis and insulin resistance. 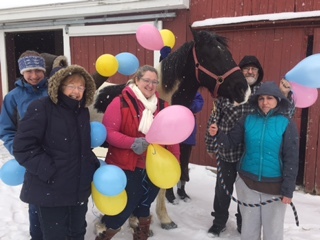 Cowboy’s last request is to have a celebration, a goodbye party! He would like balloons, cookies, and cards. I would like to honor this request and invite all to come and celebrate his life. He is a true healer and I would like to share this time to give thanks to Cowboy. The session left me feeling much better about sending him away to get better. He believes that this is possible. I believe that his voice is important and if possible should be honored. If his physical issues change we will check in with him again to see how he feels and make sure he understands what is happening. . Cowboy had a wonderful time! Thanks to all who made his celebration special! Previous postAnna is overjoyed to return to Soulful Prairies in October!